Like most of you all, I wear many hats. As part of that multiple hat wearing fetish of mine, I just returned last night from a week-long trip taking 21 teenagers (ages 13-18) to Billings, Montana for a week-long youth event. Let me say first off that it was a wonderful experience and I had a great time. But I’d be lying if I said driving them to Billings was in the “Great Time” column. The scenery was fantastic — which if you’ve never had the chance to drive about this awesomely geographically diverse nation, I would highly recommend it. However, if you have a choice of the hormone levels, deodorant-applicating skills, and musical tastes of your fellow road trippers, I would recommend erring on the side of caution. Because nothing can bring down a driver’s road-tripping mojo like crabby passengers. Or, hearing “Are we there yet?” within two hours of leaving the front door. Most of the time, the constant chatter (or snoring) from the back seats didn’t bother me as I like driving and just checking out my world as I pass through it. But there were a few times when i had to grit my teeth a bit before responding, “Just another six hours or so” in a close approximation of a cheery voice. Most of us can tolerate having folks in our “personal space” if we know there is a limit to the experience. No one likes to have people step on their pillow. 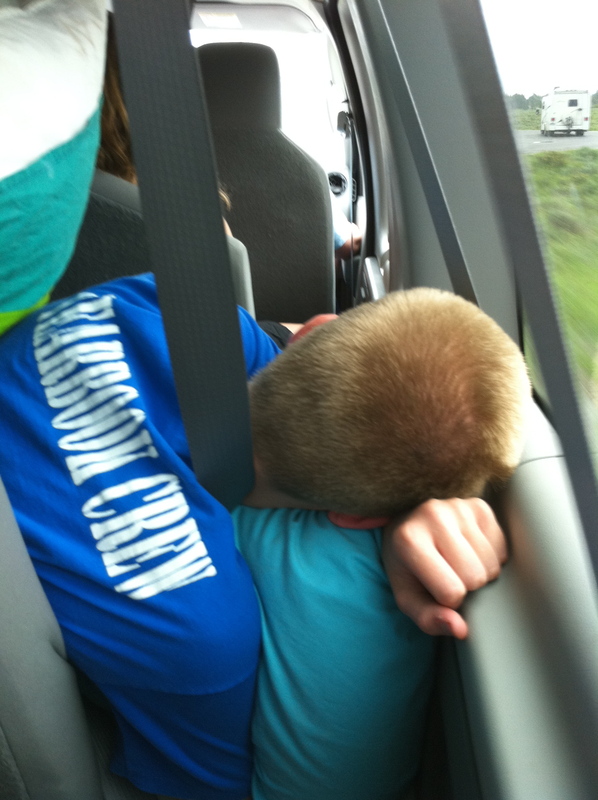 If you are tired enough, you can sleep anywhere, anyhow. Whatever you forget to pack, you will need. One can become too dependent upon technology. Having AT&T in Montana and Wyoming is a good example of just how frustrating such a dependency truly is. If you look, you can find the good in anyone. It may be small and it may be well hid, but it is there. The best apology contains no buts. If you are “tasty” to mosquitoes, other folks will like sitting by you. If the line to the bathroom is long, the next available stall will either have no toilet paper, a broken lock, or a personal disaster from the last user. Your ability to cope with such things is dependent upon your level of desperation to void your bladder. In a pinch, even really bad coffee helps. Hugs are some of the best items in your first-aid kit. They fix a lot of stuff or at least provide passable triage until a bigger fix can be found. 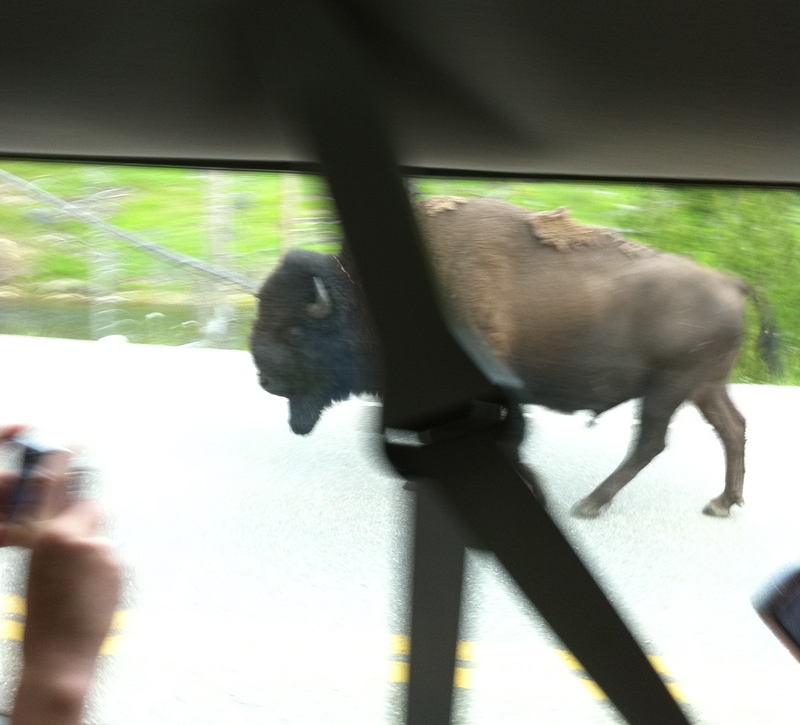 A male bison walking down the highway is an effective way to stop traffic. The 180 affected folks just don’t get as crabby about waiting for lumbering bison as they do about road construction. Somedays, you just aren’t in the mood to see a rainbow. But sometimes seeing a rainbow opens your eyes to seeing lots of other good stuff. Namely in your fellow travelers. Most of us are uncomfortable with the unknown. The only answer to “Are we there yet?” is “Not yet” regardless what the exit signs may say. Because most of us are not yet there, regardless of where we are headed, I hope you find something of beauty along your path. This entry was posted in Front Page and tagged Billings Montana, bison, journey, road trip, teenagers, Yellowstone by kristina. Bookmark the permalink. They waited as long as two hours? Wow. LOL! I know, I should be thankful they were entertained for that long! I have finally managed to get my iPhone to speak politely to my iMac, so have uploaded some pics from the trip – if you care what my lumbering bison looked like. I’m sure not there yet, but my last month has certainly helped me enjoy the journey. Glad you had a good time with the big kids. Thanks for sharing! Seriously!